The relationship between Nike and Paris St-Germain is one of the most durable in world football, with this year marking the 30th anniversary of their first link-up (only broken by the old rules forcing teams to wear adidas in cup competitions). 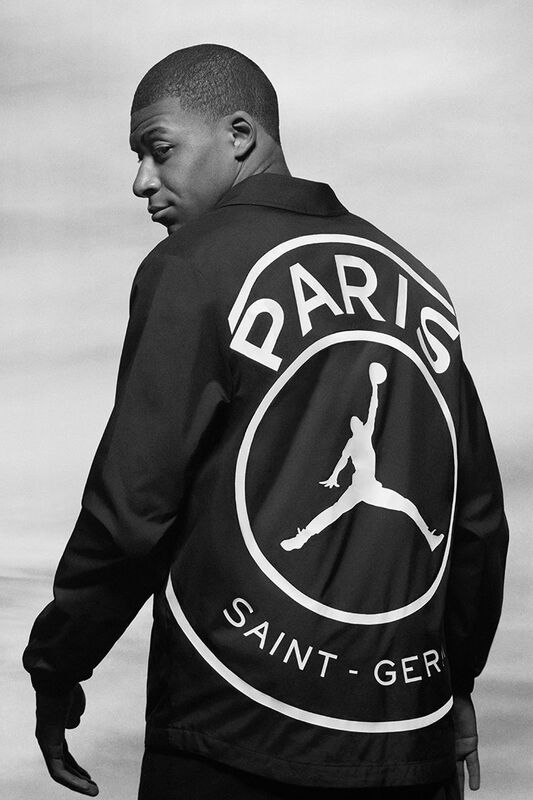 Of course, PSG have carried another maker’s logo on their kits in the Champions League this season, but Jordan is a sub-division of Nike rather than a competitor – incidentally, the word is that their ‘proper’ kits for 2019-20 may feature the Jumpman rather than the swoosh. One interesting feature of the PSG-Jordan link is how some merchandise features the Jumpman replacing the Eiffel Tower on the club crest. Given that the landmark is such a strong shorthand for Paris, it’s perhaps surprising that it hasn’t featured more on the club’s apparel, but the second Nike PSG home shirt, in 1990-91, couldn’t stand accused of neglecting it. On first glance, there would some civic pride involved in the inclusion of the abstract stylisation of the tower. Paris had put forward its candidacy to hold the 1992 Olympic Games and the campaign logo was the basis for the shirt design. However, as Alex says in the comments below, the vote would have taken place in 1986, meaning that this wasn’t part of any advertising, seemingly just an appropriation of the design. Incidentally, while Paris pitched for both the 2008 and 2012 Olympics, neither logo featured the tower. However, the city will host the 2024 Olympics and that logo is very similar to the one for 1992. An additional point of note regarding the kit was that this marked the end of the club’s sponsorship deal with RTL, which dated back to 1974. However, on the field, the 1990-91 season wasn’t hugely memorable for PSG as they finished ninth in the league. Things would get better for them as the decade went on and Nike would also make more of an impact. This season saw the American firm increase its representation in Europe with the addition of the Borussia Dortmund contract (their first Nike kits are assessed here) and one would have to imagine that having a common maker was a factor in the clubs playing each other in a friendly around that time – the first all-Nike football game? I hate to do this, but the vote for the host of the 1992 Olympics was held in 1986, so the 1990-91 PSG shirt couldn’t have had anything to do with it. I do agree that the design on the shirt does look a lot like the Paris 1992 bid logo, though. Of course Alex, I feel a bit silly for not realising that! Mixed emotion about this kit. 2nd Nike kit, it was the very 1st home kit to not respect our classical design (navy with red central stripe surrounded by two small white stripes, or white with navy & red offset stripe). It’s a bit to me like they opened Pandora’s box. It was designed by Guy Adam, a PSG manager, after, as you said, the 1992 Olympic Games candidature. It was used all season long in 90-91 and half of the following with Commodore and Müller sponsors. In the middle of the season, they changed for the white awfull shirt they used in 92-93 season. I own 3 of this shirt, the 90-91, the 91-92 and a no sponsor match worn during PSG – Flamengo, 1991-92 Tournoi de Paris.